A recently completed phase I study of CTO in a refractory patient population demonstrated safety and tolerability with no dose limiting toxicities. 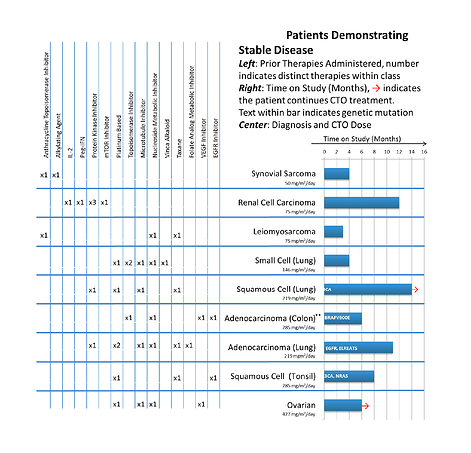 Nine patients pretreated with different targeted and non-targeted drugs continued dosing beyond 2 cycles and responded to CTO (doses 75mg/m2/day through 427mg/m2/day) and achieved stable disease for different periods (3-14 +months). The tumors were different types and contained various oncogenic mutations. CTO alone is safe, tolerated, orally bioavailable and exhibited clinical activity against a broad range of heavily treated refractory tumors with different mutations. 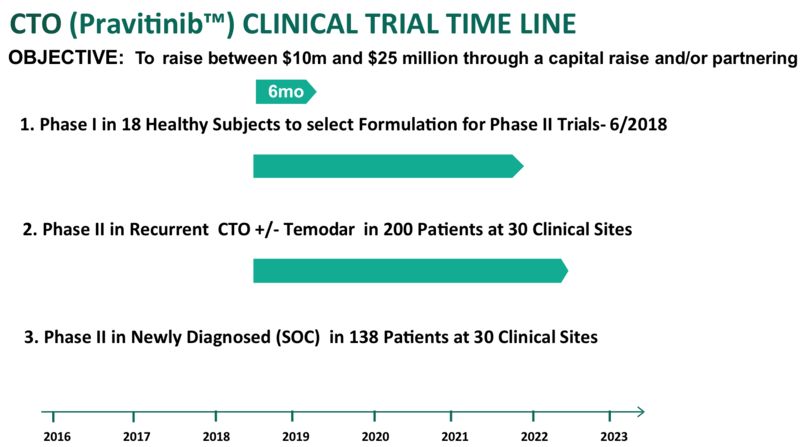 CTO in combination with Temodar has been administered to 17 patients to date with no grade 4 or 5 adverse events and no dose-limiting events. MTD has not been determined. 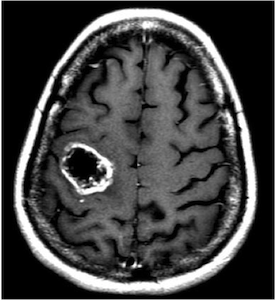 As of December 5, 2013, 17 patients with glioblastoma or recurrent malignant gliomas have been treated with Temodar 150 mg/m2 and CTO at doses from 219 through 625 mg/m2/day. Dose escalation is at CTO 812 mg/m2/day In Arm B of the phase I/II study, four patients treated with CTO + Temodar are continuing treatment with stable disease. 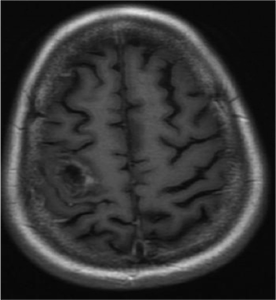 One patient with unmethylated MGMT negative astrocytoma IV was refractory to Temodar. The patient achieved durable stable disease for 11 cycles. †Temodar alone has no effect in MGMT negative tumors. Therefore, CTO induces sensitivity to and chemosynergy with Temodar Sources: Galldiks N, Berhorn T, Blau T, Dunkl V, Fink GR, Schroeter M. “One week on-one week off”: efficacy and side effects of dose-intensified temozolomide chemotherapy: experiences of a single center. J Neurooncol. 2013 Apr;112(2):209-15. Burkhardt JK, Riina H, Boockvar JA. 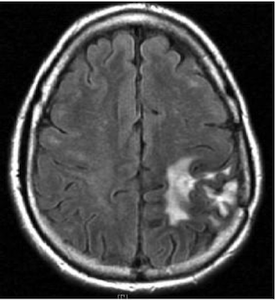 Intra-Arterial Delivery of Bevacizumab after Blood-Brain Barrier Disruption for the Treatment of Recurrent Glioblastoma: Progression-Free Survival and Overall Survival. World Neurosurg. 2012(1): 130-4; Tactical Therapeutics clinical trial data. January 2014. A partial response has also been demonstrated in MGMT negative patient 004-45. The response in MGMT negative patients, which is a difficult to treat population, indicates an induction of sensitivity to and chemosynergy with Temodar. CTO in doses from 219 to 625mg/m2/day in combination with TMZ (150mg/m2) is safe; dose-escalation is at CTO 812 mg/m2/day. MTD has not been determined. Durable Partial Responses (DPR) (6-13+ cycles) have been observed in 4 of 17 refractory patients, some continuing in 14th cycle. 9 of 17 patients received combination treatment beyond 2 cycles. 2 patients with DPR have Negative MGMT status; 1 patient has Positive MGMT status, providing evidence of synergy between CTO and TMZ in chemo-sensitive and chemo-insensitive MG and GBM. 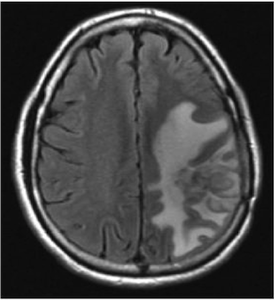 These signals of clinical activity in recurrent MG and GBM are encouraging, and a Phase II trial is planned. Other studies started are CTO with TMZ and radiation therapy in newly diagnosed patients, and CTO with bevacizumab, in patients with MG and GBM.